Theresa Rosenthal has been freelance writing for over 10 years on the subjects of health, frugal living, cooking and family. Her work has appeared on various websites. She has her Master of Arts in holistic health education, nutrition from John F. Kennedy University and has been a practicing holistic nutrition and wellness coach since 2008. Breastfeeding an infant is a round-the-clock job. Sometimes the hardest part is remembering to take care of yourself. You may already be aware that what you eat and drink will be passed on to your baby when you’re nursing. 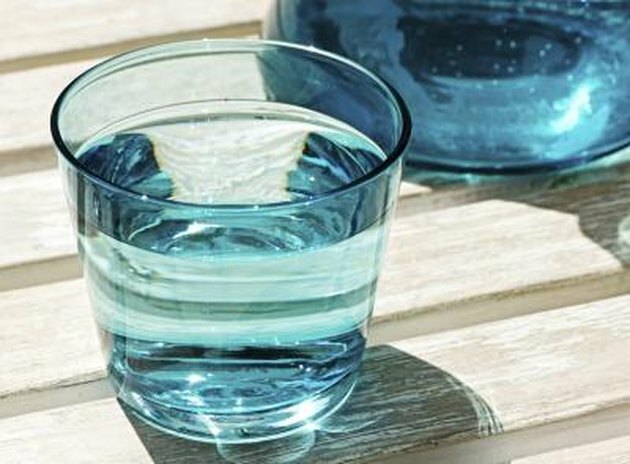 Still, do you know how much water you should drink to stay well hydrated? Depending on your age, activity level and health, you need between ½ and ¾ oz. of water per lb. of bodyweight. A simple way to figure out your hydration needs is to take your bodyweight and divide it by two. If you weigh 120 lbs., you should consume 64 oz. of fluid each day. Infants have higher hydration requirements, needing 1 1/2 oz. of fluid per lb. of bodyweight each day. Infants can obtain this through breast milk, but they need extra water if they are formula fed. An excessive amount of water is discouraged for infants, because it can fill them up, replacing nutritional calories. Keep water nearby when you are breastfeeding, because you’ll need the extra fluids. La Leche League International reports that women feel thirstier when they are breastfeeding, especially when they have a newborn. Drink whenever you feel thirsty. A good way to check your hydration level is by looking at the color of your urine. If it’s clear or light colored, you are probably sufficiently hydrated. Carry water with you so that whenever you feel thirsty, you’ll have it available. Water bottles come in sizes ranging from 8 oz. to 64 oz. Select bottles that will fit in your car's cup holder, your purse, your briefcase and your bike or treadmill. Consume foods that have high water content, such as watermelon, fruits, vegetables, soup, popsicles and water flavored with fruit. Adding a squeeze of lemon or orange juice to your water may make it more palatable. Diuretics cause you to urinate more frequently, draining the water from your body. Examples of diuretics are caffeine, soda, alcohol and tea. Sugar may also inhibit the absorption of water, making it an unhealthy choice as well. Consuming too much apple juice or sorbitol-containing juices such as prune and pear juice can cause diarrhea, which will perpetuate dehydration. Fluids during meals are not recommended either. Your body creates specific fluids for digestion, and consuming water in addition to these fluids may cause indigestion by diluting the digestive juices. Kelly Mom: Do breastfeeding mothers need extra calories or fluids? How Much Water Does the Human Body Need Daily?